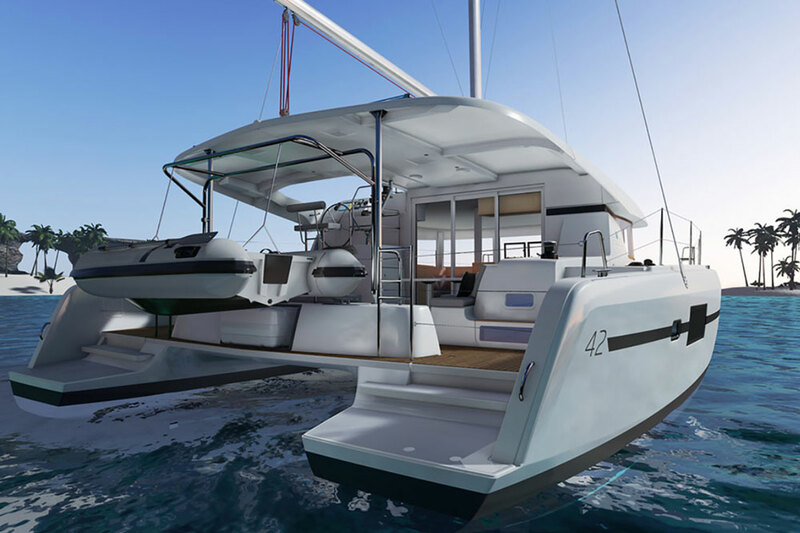 The new Bali 4.5 from Catana introduces a fresh take on layout and outdoor living. 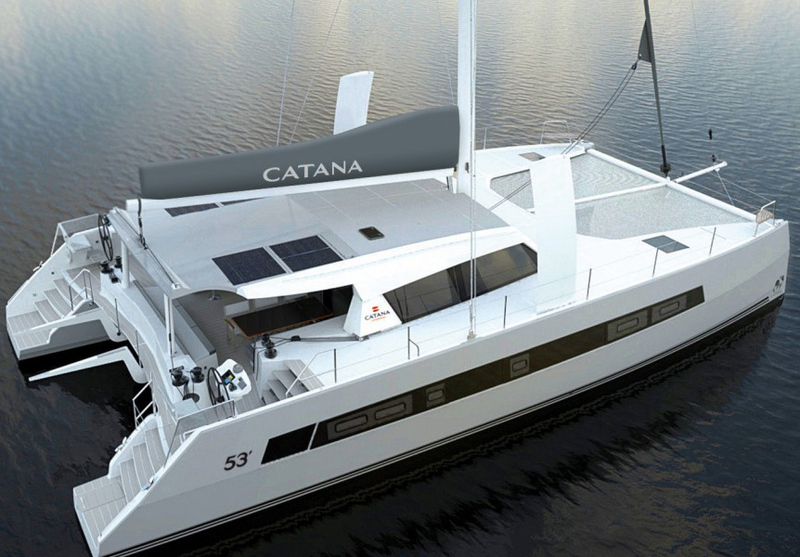 The Bali 4.5 may be built by Catana, but this cat is clearly a different creature. Cats tend to keep the forward deck light by incorporating bracing beams and netting, but Bali has added a solid deck with two tables and forward-facing seating for eight. Just ahead is a lounge that will accommodate six reclining sunbathers in comfort. The large vertically-sliding windshield is great for airflow and connects the inside with the outside. Food and drinks can be passed through without ever exiting the galley, leaving the boat completely connected from one end to the other. 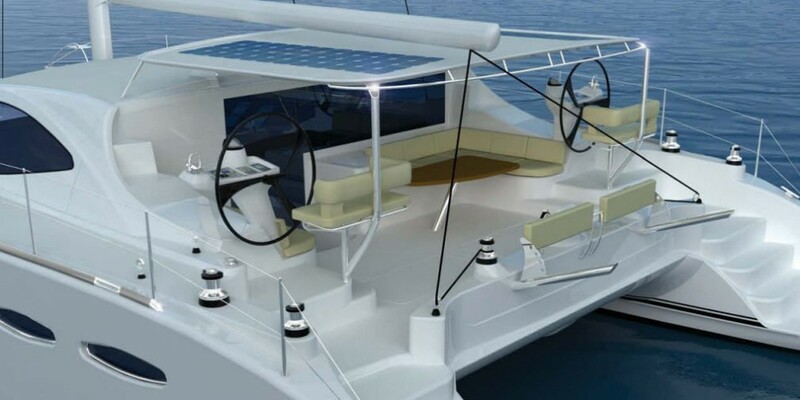 Two helm configurations are available on deck. The standard is the starboard-side helm with a roomy command pod offering a seat for two and plenty of dash space for electronics, engine throttles and gauges, and a compass. An optional flybridge can be specified and hull number one of that version was our test boat. 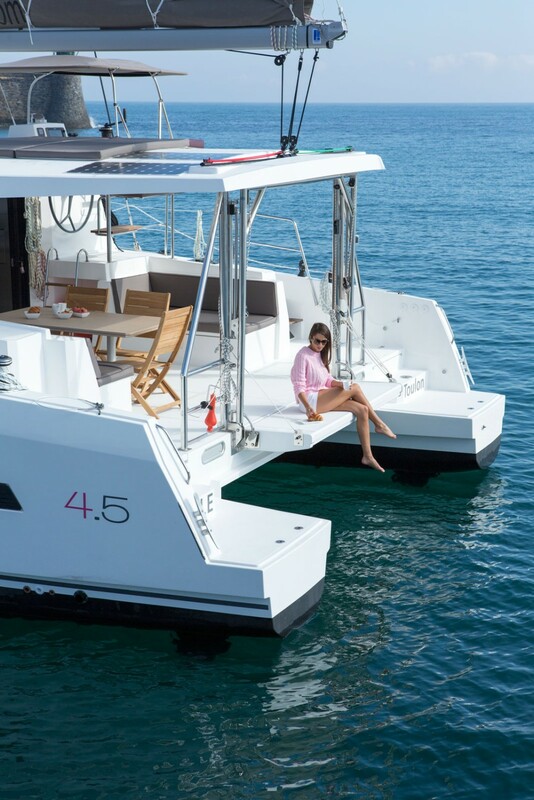 The pluses for the flybridge include seating for four and good visibility forward. 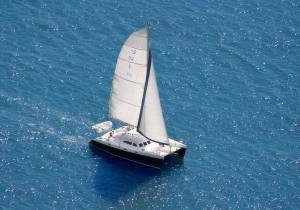 The drawbacks include a smaller mainsail (since the boom starts higher off the waterline), more weight up high, dash space down by the knees which makes instruments hard to see, and a longer trip to the side decks when docking or the bow when anchoring. It’s also more cut off from the social activity in the cockpit whereas the side helm version has direct access, which keeps the driver in contact with others aboard. Both layouts offer ample space for sunpads, for lounging up high. The aft cockpit will accommodate a group of 12 with a port side dinette that will seat six or eight with additional chairs. A straight lounge is to starboard in the cockpit and it looks ever-so inviting; stainless-steel dinghy davits lower down to the waterline and once deployed a vertical section of the transom folds down to extend the cockpit by another two feet. That will make a difference when entertaining a crowd aboard. The transoms on either side are blunt to ease boarding in Med-mooring situations. Engine access is adequate; Bali fits an oversized 225 amp alternator on the port side along with an Aquabase engine-driven 50 gph watermaker. This shows that the builder is keenly aware of the keeping the crew happy with good water and power management. A self-tacking solent on a Facnor furler has its track just ahead of the mast on the cabintop and that helps keep the forward deck clear for socializing, even under sail. The Sparcraft aluminum mast supports 1,300 square feet of sail area (Elvstrom is the standard brand) and a Code 0 sail, attached to the bowsprit, would be a great addition for downwind sailing. The hulls have a high chine, about two feet off the water, which should deflect spray and provide more interior volume. The nacelle under the deck is high and angled to minimize any under-deck pounding when going to weather. Because the Bali has fixed keels (rather than daggerboards like its Catana cousins) it will not point as high, but still puts out a good turn of speed with the wind at 60 degrees or farther aft. The construction is a vacuum-infused sandwich that gets all the engineering benefit and quality of the parent brand since it is built in the same facility in Europe. Like on many cats, a sliding aft door and separate window lead from the cockpit to the interior, joining the inside with the outside. Here, there are a few features that leap out at you. To starboard is a full size side-by-side refrigerator with a built-in icemaker. This is an AC fridge. The good news is that it has all the convenience of a home-style fridge and it can easily be replaced with a household brand. However, it isn’t engine-driven so it relies on a large, 720 amp-hour battery bank that’s kept up with the aforementioned alternator and a solar array on the hardtop. The optional 11-kW Onan genset will help as well. To port is a full galley with dishwasher, an Eno cooktop and an oven. This is quite the kitchen with tons of countertop space, so multiple cooks can share meal preparation and not get in each other’s way. A settee that will seat six is in the forward starboard quarter. The table moves in and out providing extra room for anyone sliding into a seat. The two opening windows fore and aft keep conversation and food flowing to both ends of the boat, without the need to run around on the side decks. The trend today is to have touchscreen control panels for most of the systems aboard, including the genset, watermaker and all pumps. It’s a clean solution with the panels installed at the outboard-facing nav station, that also has room for the Fusion stereo head and repeaters for the electronics mounted at the helm. 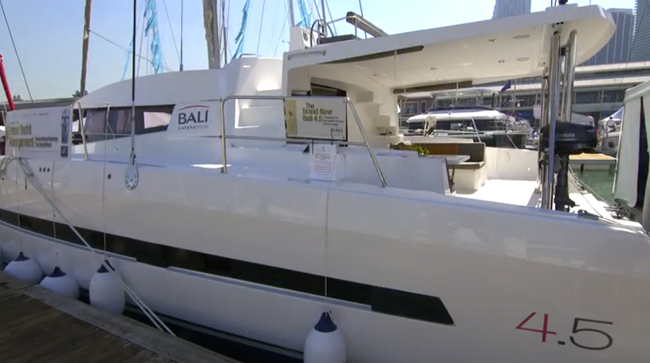 The owner's stateroom takes up the entire port side hull of the Bali 4.5, unless you opt for four staterooms. Three and four cabin/head layouts are available. In the three cabin/three head version, the owner’s suite occupies the port hull. The bed aft is wide and a sofa and desk separate the sleeping quarters from the head with his-and-hers sinks just like in a large bathroom at home. 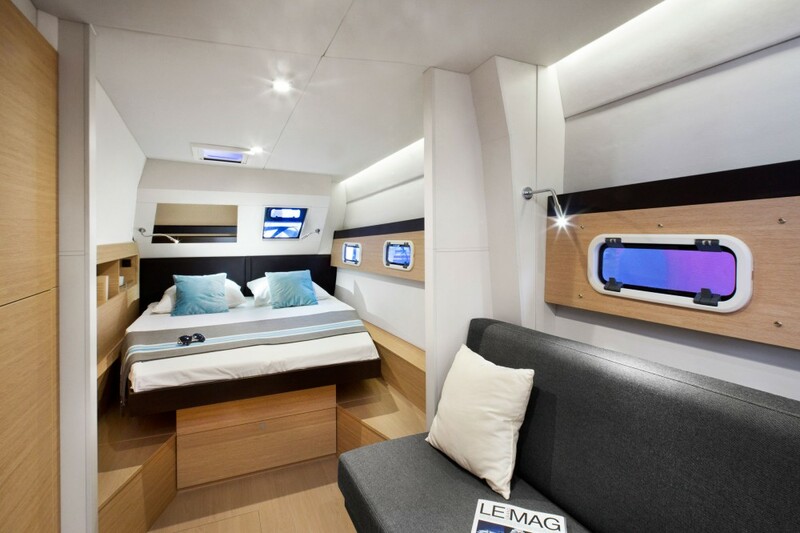 Guest accommodations occupy the starboard hull with two cabins and two ensuite heads. Auxiliary power is provided by twin 40 HP Nanni diesels that may be upgraded to 50 HP, as they were on our test boat. The Saildrive units have been turned 180 degrees in order to set the rudders well aft. At 2,000 rpm on flat water we motored 6.8 knots, and flat out at 3,200 rpm, we reached 8.6 knots. Bali is obviously planning for a positive charter experience by providing 221 gallons of fuel as well as water. With that added watermaker, there will be freshwater showers for everyone aboard each night, and a clean crew is a happy crew. Our test sail had ideal conditions on the flat waters of Biscayne Bay. In 12 to 15 knots at 60 degrees apparent wind angle, we sailed at 7.2 knots. As we cracked off to a beam reach, we saw speeds around 7.5 knots and at 120 degrees, we still maintained 5.1 knots. The self-tacking solent means you barely move anything but the wheel during a tack, so single-handing is a breeze. Sail Area 1,302 sq. ft. This new offering is expected to sprout both larger and smaller siblings. 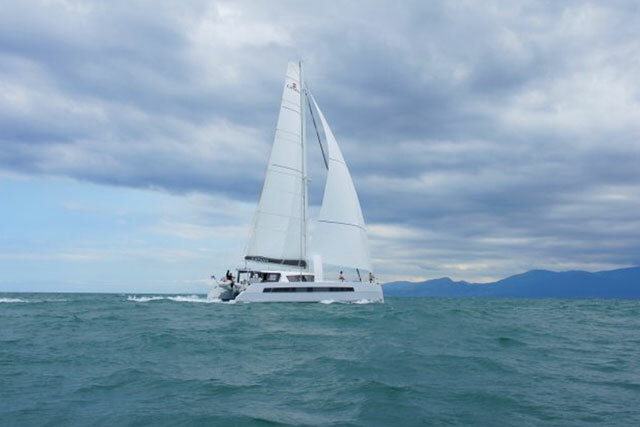 With Bali, Catana is actively positioning the brand for charter as well as private ownership. The base price is $650,000 but there are many options available that will vary the final cost dramatically. This is a change for a buider that likes to sell optioned-out cats for passagemaking. Perhaps offering more choices at a lower price point will broaden their market. 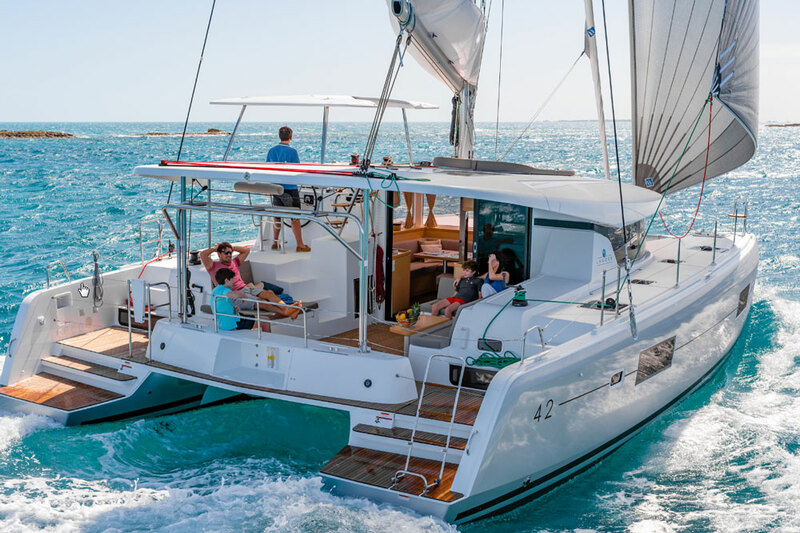 Sixty to 80 Bali cats are expected to be turned out per year once the brand is established, and that will also help Catana spread the fixed costs of their facilities over a greater number of hulls. 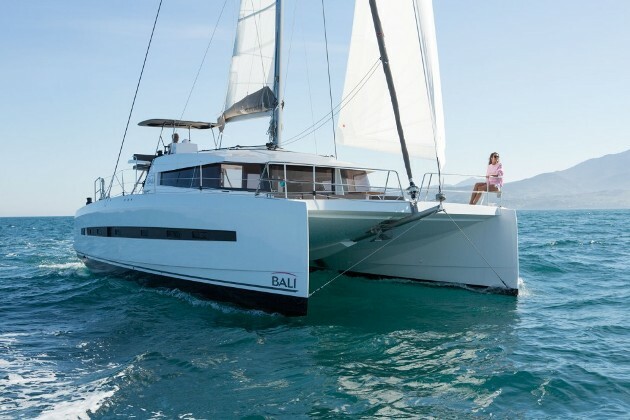 In the meantime, Bali owners will benefit from the quailty build Catana is known for—and an innvoative design that is unique on this size of cat. 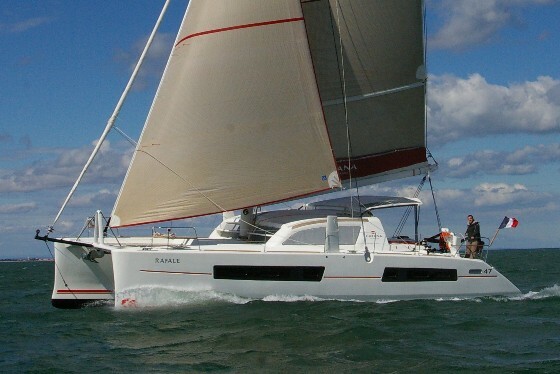 Other Choices: Some other sailing catamarans to consider would be the Lagoon 440, Fountain Pajot Helia 44 and the and the Gino Morrelli-designed Leopard 44 that features a forward cockpit. Each of these models will be comfortable, although the forward-thinking front patio with all that “open space” is only available on the Bali 4.5. For more information, visit Bali.